Et Verbum: The Condition of the Suffering souls in Purgatory, by Rev. John A. Nageleisen. § 57. The Suffering Souls Show Their Gratitude by Praying for Their Benefactors. Part 1. The Condition of the Suffering souls in Purgatory, by Rev. John A. Nageleisen. § 57. The Suffering Souls Show Their Gratitude by Praying for Their Benefactors. Part 1. 417. Our Divine Redeemer exhorts us, "Make unto you friends of the mammon of iniquity, that when you shall fail, they may receive you into everlasting dwellings." (Luke xvi. 9.) The souls of the faithful whom we deliver from the depths of misery and lead to supreme bliss by means of the "mammon of iniquity," become our most grateful friends and incessantly implore God to shower upon us His choicest blessings and bounties. We cannot but believe that they will remember us in heaven with the greatest gratitude. Or would we dare to accuse the saints of that base ingratitude which we sometimes experience at the hands of men here below, where, alas, ingratitude is nothing unusual? Our Divine Savior Himself experienced it. "Were not ten made clean, and where are the nine?" (Luke xvii. 17.) Since and before that time ingratitude was and is still of daily occurrence here on earth. But in heaven where nothing defiled enters this vice has no place. There charity reigns supreme, and base ingratitude is banished forever. 418. From this we may conclude with what gratitude all those souls will intercede for us, whose admission to heaven we have hastened by our suffrages. As gratitude demands that benefits be returned with benefits—will they permit that our prayers which obtained for them so great a boon shall surpass theirs in fervor? As we came to their aid so charitably when they were unable to do anything for their own relief, will they desert us of whose needs they are so well aware? As wayfarers on earth they observed the law of Christ—they loved even their enemies, doing good to them that hated them; and now that they are in heaven, will.they not love their most active friends, to whose charity they owe the hastening of their bliss, and prove this love by constant intercession for them? St. Alphonsus Liguori says, ' Whosoever comes to the aid of these distressed souls, so dear to our Lord, may confidently hope to be saved; for if such a soul is released through his prayer and good works, it prays incessantly for his salvation, and God will not refuse to hear His spouse." Bishop Colmar of Mayence, a great friend of the Holy Souls, remarks: "If I could know for certain that I had the happiness of releasing one of those souls, all my dread and fear of eternity would vanish; I should regard my salvation as assured. For such a soul could not witness me going to perdition without imploring mercy for me so fervently that the Lord would grant me His mercy." 419. The Suffering Souls in Purgatory do not wait until they arrive in heaven to give evidence of their gratitude to their benefactors. Even while suffering the most dreadful torments they are anxious to return their charity; and hence they pray incessantly for the spiritual and temporal welfare of those who succored them. It is true St. Thomas teaches that the state of the Holy Souls is a higher one than ours, because* it is no longer possible for them to commit sin. But their state may also be considered as being lower than ours, on account of the punishment they are obliged to suffer. Being in a state of suffering they are in a position rather to receive than to give help. The members of the Church suffering can no longer acquire merit, nor can they effectually make intercession for others. They must render atonement to Divine Justice "to the last farthing. "—A drowning, a burning man's thoughts are centered too intently on his own dangers to be drawn to other occurrences around him. Thus the Suffering Souls are wholly occupied with their torments: "Have pity on me, have pity on me, at least you my friends ; for the hand of the Lord hath touched me." (Job xix. 21.) And as the souls in the prison of Purgatory do not as yet enjoy the vision of God, and are therefore not aware of our thoughts, desires and prayers, they are not in a position to act as intercessors for us, but they rather have need of our prayers. 420. This is the doctrine of St. Thomas. But as the Church has not dogmatically declared for or against this doctrine, the question,"Can the souls in Purgatory, while in the state of suffering, intercede for us with God?" is an open one. Theologians are divided on it, and the Church tolerates the opinions of both sides. And if we ask the religious sentiment of Catholics in general, this question is confidently answered with, "Yes!" Most commentators of St. Thomas declare that his doctrine does not conflict with this opinion. According to the opinion of the Angelic Doctor—and his opinion is the general one—the Suffering Souls are not official intercessors for the Church militant in the same sense as are the saints in heaven. Their position is not that of intercessors, but of beneficiaries for whom we ought to intercede; our position, as far as gaining merit and helping them is concerned, being preferable to theirs. Our prayer, addressed to God in the state of grace, is always heard, according to our Savior's own declaration, "If you shall ask Me anything in My name, that I will do." (John xiv. 14.) These words were addressed to the living, not to the dead. 421. According to St. Thomas it is the will of God that the inferior should be assisted by the superior. Since it is true that the souls in Purgatory, by reason of their captivity, are in a state inferior to ours, it might seem, because of this inferior state, that they can not pray for us. But as they are also in a state superior to ours,since they are beyond the possibility of committing sin, does it not follow that they can pray for us? It is not necessary that they should possess every claim in order to be entitled to pray for us; it is sufficient that they possess one. Hence some followers of St.Thomas call the doctrine that the Suffering Souls can pray for us the common one. For as far as this second reason is concerned, they can be our intercessors the same as the saints in heaven, because they are in the grace and favor of God. Our motive of praying for the Suffering Souls should be rather a desire to help them, than to receive their help. It should be our principal object to pray for their aid and deliverance, rather than to obtain their assistance. But their condition is no obstacle, to their prayer for us. 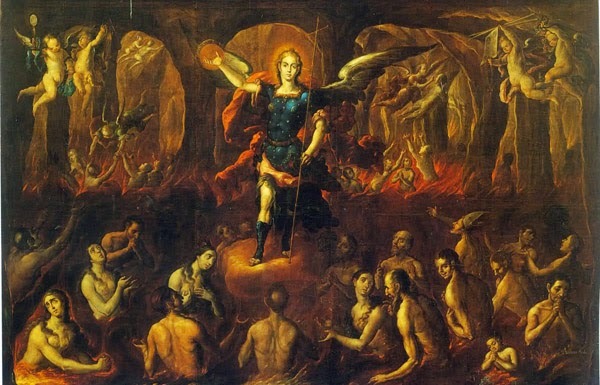 Gregory of Valencia maintains that the souls in Purgatory pray for the faithful in general, but particularly for those who were very dear to them on earth. Bellarmine, Suarez, Sylvius, Gotti, Jungmann and many others are of the same opinion. 422. The renowned theologian Scheeben remarks on this question: "The souls in Purgatory being confirmed in charity, it seems not only probable, but evident that they actually pray. That is, they present petitions to God in favor of the Church militant, and particularly in favor of their benefactors; otherwise their charity would be powerless and inert. If here on earth we should and do pray for others, how much the more is it not to be expected of those Holy Souls! The state of grace, on which the intercession of the Suffering Souls depends as on its fructifying principle, is the very principle on which the prayer of all other just souls depends for its efficiency. Every just soul is a beloved friend of God. As the souls in Purgatory are no less friends of God than the just on earth, it would be a deflection from the order of grace if their charity were disregarded and unrequited in the very acts which are especially pleasing to God. This deflection becomes still more apparent if the communion of saints is taken into consideration. This communion being the uniting bond of the mystic body of Christ, its unity must of necessity be like that of any organic body. This unity requires that every living member of the whole communion, each in his way, shall contribute by his ministrations to the welfare of the whole body; that consequently no living member shall act as the mere recipient of the benefactions of the rest, without himself being useful to the others; and particularly that he shall not receive favors from the other members without making a return to them by grateful reciprocation." 423. Continuing his argument Scheeben adds: "This last mentioned motive of gratitude is of special import. Its principle is recognized, because it is a doctrine universally taught in the Church that the Suffering Souls, at least after their entrance into heaven, efficiently remember at the throne of God those whose benefits they received. But why should their gratitude remain sterile and ineffective till then ? Is it not true that the Holy Souls are no less dear and pleasing to God in Purgatory than they will be later in heaven ? Would not their prayer in many instances be too late, especially as regards graces to be obtained for their benefactors while these latter are yet on earth? And would not the motive to pray for the Suffering Souls be greatly weakened—the motive arising from their gratitude towards their benefactors —if these Souls could pray effectually for their liberators only after they are released from Purgatory?